Toluca Lake is one of those places people visit, but ultimately decide to call home. The affluent Los Angeles neighborhood is full of history that dates back to the 1760s, when the Tongva people inhabited the Toluca Lake waterfront, into the 1920s when the area’s natural swampland was turned into a 6-acre planned water feature. The lake itself - home to some of the most sought-after Toluca Lake apartments and homes - is completely private with no public access, which has created a peaceful haven for those lucky enough to live near its shores. The in-demand city is home to the first International House of Pancakes, which opened in 1958, and the original Bob’s Big Boy drive-in in 1949, the oldest-remaining establishment in the restaurant’s chain. Griffith Park - the largest urban park in the country and home to miles of trails, the Hollywood Sign, Griffith Observatory, and the Old LA Zoo - is just a few minutes away from the area’s Toluca Lake apartments, as is Warner Brothers Studios, which opened one block from Toluca Lake in the late 1920s. History aside, Toluca Lake is full of modern amenities and cuisine types from around the world. Head over to Ca Del Sole or Prosecco Trattoria for delicious, authentic Italian dishes, get your sushi fix at Sushi Yuzu on Riverside, and end the evening with coffee and dessert from Sweetsalt Food Shop. When the evening calls for world-class entertainment, the annual Toluca Lake Fine Arts Festival is steps from Toluca Lake apartments, and the neighboring NoHo Arts District boasts more than 20 live performance spaces less than 2 miles north of Toluca Lake. 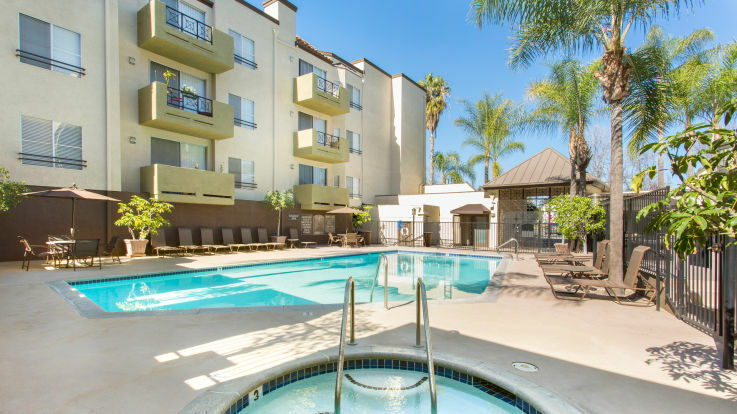 Getting around Southern California from Toluca Lake apartments is a breeze, thanks to the neighborhood’s close proximity to US-101 and Route 170, just a short drive from I-5 and I-405. Nearby Burbank, Glendale, West Hollywood, Beverly Hills and LA are all easily accessible for work and play, giving residents thousands of food, nightlife and entertainment options just outside their front doors.